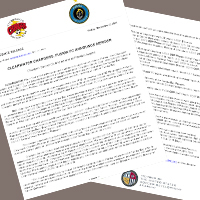 12/2/11 - Press Release - Announced the merger of the Clearwater Chargers & Fusion Futbol Club. Two of the oldest and most tradition-rich youth soccer clubs in Florida - the Clearwater Chargers and Fusion FC - are pleased to announce a merger to become “Chargers Soccer Club”, effective with tryouts at the end of May 2012. The merger will provide soccer opportunities to youth players throughout the Tampa Bay region with programs and fields in Pinellas, Hillsborough and Manatee counties, covering all sides of Tampa Bay. The merger brings together a pair of clubs established in the 1970s to create a club of 80-90 competitive teams and three recreational programs with more than 2,500 players utilizing 50 soccer fields in three counties. The Clearwater Chargers operate out of facilities in Clearwater and Lakewood Ranch, while Fusion FC’s facilities are located in Tampa. Both clubs have a long history in the Tampa Bay area of developing players who have gone on to be successful in college programs, on U.S. Soccer national teams and in the professional ranks. The list includes current and former MLS standouts such as Kenny Cooper of the Portland Timbers, Bobby Boswell and Richard Mulrooney of the Houston Dynamo, Zac MacMath of the Philadelphia Union, Jeffrey Cunningham and Korey Veeder of the Columbus Crew, Blake Wagner of Real Salt Lake and Scott Bower of the San Jose Earthquakes. Among other notable alumni are Bryane Heaberlin, (US U17, U18 and U20 Women’s National Team goalkeeper, recently committed to the University of North Carolina), Eugene Starikov (FC Tom Tomsk, Russia), Jeff Attinella and JP Rodrigues (FC Tampa Bay), Brian Waltrip (Norway), Gus Kartes (Greece), Joey Collewijn (Holland and England), Kevin Pahl (U14 and U15 US National Teams), and Atsou Ayah, (current U18 Chargers Academy team member, formerly of the US U17 National Team Residency Program). Chargers Soccer Club is expected to draw players from six counties with the continuation of their local soccer opportunities as well as additional regional and national opportunities. Players age 4 to 19 will compete in recreational “in-house” leagues (U5-U10), recreational travel leagues (U12-U19), and the top competitive soccer leagues in the state, region and nation (U9-U18). Clearwater Chargers Soccer Club is currently one of four clubs in Florida and 78 in the nation to serve as a United States Soccer Federation Development Academy for boys U16 and U18, and is also part of the Southeast Pre-Academy League (U14 Boys). Additionally, the club has an application on file for participation in the Elite Clubs National League (ECNL) for girls U14-U18. “This is a great opportunity for two of the longest-standing clubs in Florida, let alone in the Tampa Bay area, to come together combining our resources to continue to provide local opportunities and player development with additional regional, national and international-level opportunities across the whole club,” said Jim DiNobile, Fusion FC Director of Soccer Operations. The Chargers Soccer Club competitive program will feature teams at multiple levels in each age group with both Region Cup and State Cup-level teams. Among the leagues in which Chargers Soccer Club teams could compete are the Club Directors League, United Soccer Association, the Florida State League, the Region III Premier League, the National Premier League, the Florida Youth Soccer Association State Premier League and the Southeast Pre-Academy League. The club will also explore the possibility of combined competitive tournament teams for players looking for the opportunity to play with their local club team as well as at major college showcase tournaments. Chargers Soccer Club will be a club where players of all abilities have a place to play, a club that stresses development of the soccer player, and a club that emphasizes - along with good soccer - striving to make a player the best person they can be through the principles of integrity, honesty, dedication and commitment. The club’s new logo, currently being developed, will proudly display three stars signifying three national championships. Fusion FC (formerly Black Watch SC and the New Tampa Soccer Association) captured the 1985 U18/19 Girls national championship, while the Clearwater Chargers (encompassing the former Countryside Lightning Soccer Club) captured a pair of National Championships (1995 & 1997 James P. McGuire Cup, U-19 Boys). The showcase facility for Chargers Soccer Club is Premier Sports Campus, located in Lakewood Ranch in Manatee County and featuring 22 fields and more than 140 acres. Currently serving as the site of the 2011 Nike International Friendlies and the USSF Development Academy Winter Showcase, the Premier Sports Campus will also host the highly successful Chargers Soccer Club Labor Day and Easter tournaments.